Integration allows True Key extension to leverage the power of Windows Hello’s secure authentication factors to provide a more secure log in and authentication experience with new browser support for Microsoft Edge. New enhanced features in the True Key app now provide greater support for desktop browsers, mobile authentication methods, and additional mobile browser support. SANTA CLARA, Calif., Dec. 7, 2016 – Today Intel Security announced the new integration of the True Key extension with Windows Hello to deliver a seamless multi-factor sign in experience on Microsoft Edge. Now, Windows 10 customers can enable the new True Key app extension integrated with Windows Hello on Microsoft Edge to enjoy an easier and safer way to unlock their online accounts. In today’s digital world, consumers increasingly live their lives online. In 2015, the internet surpassed more than 1 billion websites with a primary method of verifying a user’s identity being a username and password. By providing built-in multi-factor protection, the True Key app allows users to increase their online security by retiring their bad password habits, and start creating long, strong, and complicated passwords for all their online accounts. With this integration, Windows 10 users can download the True Key Microsoft Edge extension, connect their True Key app profile and enjoy Windows Hello secure authentication factors. The True Key extension will remember a user’s existing passwords and create new ones, as well as automatically fill in their username and password when logging in to websites or apps. To enjoy this more secure and seamless sign-in experience download the True Key extension for Microsoft Edge from Windows Store, then go to your security preferences and enable Window Hello authentication. Additional Desktop Browser Support: In addition to supporting Internet Explorer, Microsoft Edge, and Chrome, the True Key app now supports the Firefox web browser for a seamless and more secure desktop browsing experience. Advanced Login Preferences for Mobile Devices: Android and iOS users can now combine up to three different authentication factors to log in to their True Key app account. Users can select from factors such as their face, fingerprint, trusted device or a master password to log in to their True Key application. Enhanced Android Features and Browser Support: Android users can now log in to the True Key app using their fingerprint as an authentication method, untrust a lost or unused PC or mobile device, and use the native Android browser or Opera browser to surf the web safely and securely. 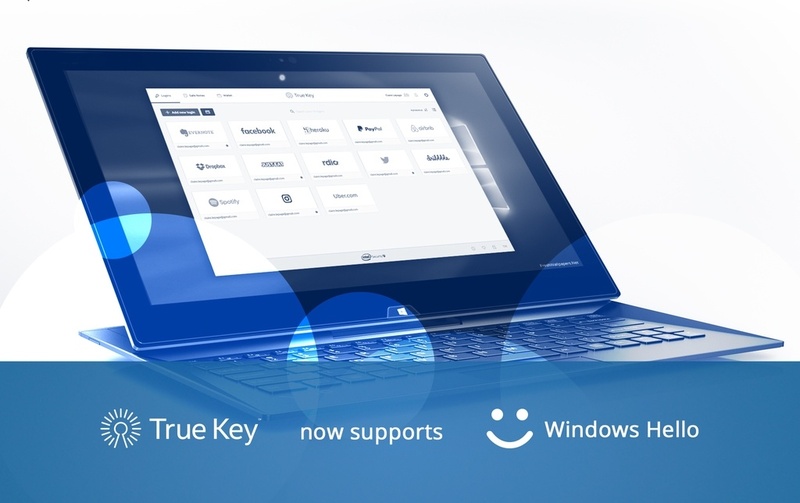 To learn more about True Key by Intel Security and Windows Hello, read the Intel Security True Key blog post. Windows is a trademark or registered trademark of Microsoft Corporation in the United States and/or other countries.